In a recent column, I observed that by many measures, China is the world’s largest economy. This means a number of benefits will now flow to China that used to go to the US and Europe. Chief among these is agglomeration, or the tendency of businesses to seek out the biggest markets and the densest concentrations of economic activity. Being the center of the global economy really does have value. But nothing is certain, especially in realms as complex as economics and politics. China’s vast size is indisputable, but it might easily make mistakes. Chief among these self-inflicted wounds would be closing the country to foreign investment, extending state control of the economy and adopting an adversarial relationship with neighboring nations. Ominously, the country seems to be doing all of these now, to one extent on another. The magic of agglomeration works best when investment can flow across borders. For many countries, there’s a temptation to wall themselves off from outside capital, and try to have domestic businesses do everything. So why shouldn’t China just block foreign companies from operating, and get homegrown businesses to do everything instead? Because if China does that, then American, European, Japanese and other multinational companies will set up their supply chains elsewhere. Instead of capturing the valuable parts of the supply chain, the country would be forced to replicate the entire chain domestically. That would waste a lot of domestic capital. And the focus of international investment would shift elsewhere, creating products that would then compete directly with Chinese offerings in international markets. Economic isolation would also cause Chinese technology standards to diverge from those of the rest of the world. Unfortunately, there are some signs that China has been creating an increasingly hostile climate for overseas businesses in recent years. China mandates that foreign companies operating in certain strategic industries form joint ventures with local Chinese companies. The multinationals’ technology is then rapidly stolen or copied; economists Kun Jiang, Wolfgang Keller, Larry Qiu and William Ridley have found empirical evidence that this is the rule rather than the exception. Add to this a thicket of rules, relationships and regulatory discrimination designed to favor domestic companies, and it’s little wonder that multinationals are growing glum about their prospects in China. The drop in foreign direct investment this year might presage a new, troubling trend. The second big danger is that China will renationalize much of its economy. Privately owned companies are more innovative, have better financial performance and are generally more productive. But the government still controls the economy’s commanding heights -- banks, telecoms, energy and auto manufacturing. Ownership of the country’s most advanced technology companies is murky, but many believe the state controls these as well. In recent years, the state’s role has been increasing. And, more troubling, China’s total factor productivity growth has been slowing. A few economists even believe Chinese TFP growth is now falling. Rising productivity is the ultimate driver of rising living standards. Increasing state control may be part of the reason for the slowdown. Looking at manufacturing companies, where productivity is easier to measure, economists Jorge Alvarez, Tuo Chen and Grace Li found that about 2011, the balance of investment started to shift from privately owned companies back to state-owned ones, after many years of the opposite. Looking at company-specific data, they conclude that the productivity slowdown in Chinese manufacturing was partly because of more capital being allocated to state-owned enterprises, and partly because of a decline in efficiency within SOEs themselves. In other words, China may be inching back toward less productive state capitalism. The final big mistake China could make would be to antagonize its neighbors. The country’s aggressive actions in the South China Sea, the East China Sea and the Indian border have not endeared it to its neighbors. Even if they don’t spill into war, tensions with neighbors could limit China’s trade relations with these countries. China has been blessed with an enormous population, vast natural resources and a geographically advantageous location. In recent decades, wise policies of reform and opening up have turned China into the world’s largest economy. If those wise policies were to continue, there would be nothing to stop China from taking its natural place as the center of the global economy. But if China’s leaders close off the country to foreign investment, allow state-owned companies to muscle out the private sector, and alienate neighboring countries, then the Middle Kingdom could squander the fruits of what it has achieved in the past 40 years. 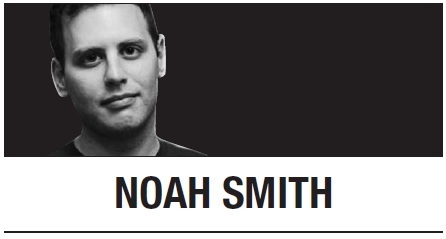 Noah Smith is a Bloomberg Opinion columnist. He was an assistant professor of finance at Stony Brook University, and he blogs at Noahpinion. -- Ed.